Six Sigma for service design is known as a separate and emerging method used to manage business processes with the help of the conventional Six Sigma. While the traditional Six Sigma uses tools and order to help in keeping certain business processes in the right place and making sure that these are fully functioning, Six Sigma related to service design has an aim of figuring out the specific needs of a business and its customers while driving the detected needs into the developed product solution. Getting a Six Sigma certification linked to service design is definitely a major help if you want to be able to help a company stay on top. The Six Sigma service design course can help anyone understand how the method helps improve the performance of a business. Aside from the things mentioned above, Six Sigma for service design is also defined by experts as a method of designing or creating a completely new process or product which is capable of meeting the specifications of customers. It should also be noted that the method uses a lot of variations. While these variations are said to carry out the same functions, these are utilized for various processes. One of the most popular variations is the Define, Measure, Analyze, Design and Verify (DMADV). This variation requires you to first define the needs of your customers by collecting data, measure and benchmark the defined needs by checking out your competitors or other industries that have met such needs, analyze any process option which you can use in meeting the benchmarked needs of your customers, select the most suitable process by evaluating its cost-effectiveness and verify the performance of the chosen process and its ability to satisfy the benchmarked needs and requirements of your clients. You can find a lot more variations for Six Sigma service design and you have to consider enrolling in a Six Sigma certification program so you will become more familiar about all these. You will have an easier time getting your Six Sigma certification for service design by enrolling in a related program offered by Brainmeasures. The Six Sigma certification program for service design that you can find in Brainmeasures uses course materials that are prepared with the help of experienced and expert professionals who have been in this field for several years. The resource materials and the online Six Sigma test that you need to take before you can finally take a hold of your skill certificate are also prepared by professionals who stick to strict ISO guidelines. This indicates that the Six Sigma training offered by Brainmeasures is comprehensive enough and the Six Sigma exam is free of errors and guaranteed to help detect the level of your knowledge in the field. Tips in using the DFSS approach to help your design team in effectively framing projects with strategic, cultural and financial implications into your business. Note: A more detailed syllabus is available for you if you check out the Brainmeasures website and log into your registered account. 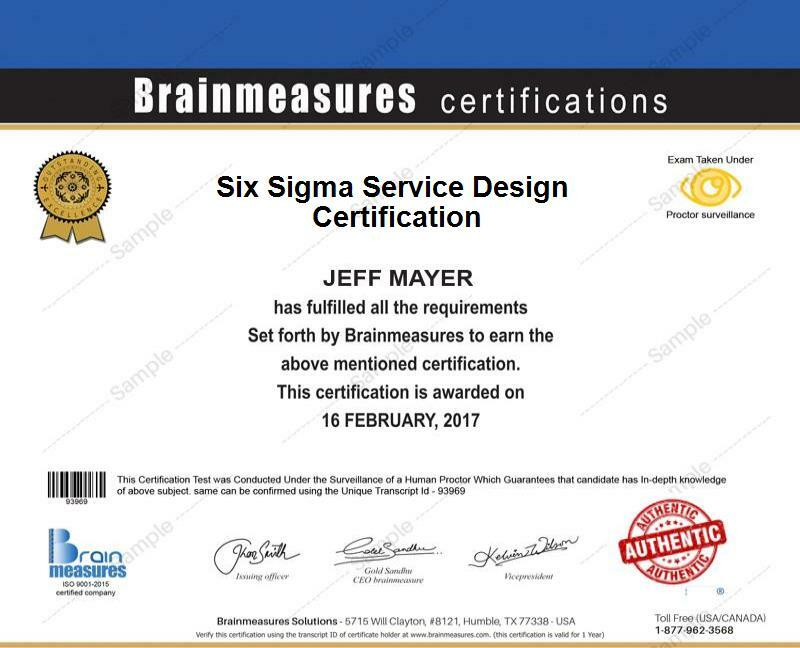 The Brainmeasures’ Six Sigma certification linked to service design is for everyone. No requirements and qualifications are mandated by the company so you can take part in the program anytime. But the course benefits those in the sales, production, human resources, sourcing, design and information technology department all the more. Because holders of Six Sigma certification for service design are extremely important in any business organization, you can expect companies to pay you a decent amount for your services. Your annual earnings when practicing your career as a Design for Six Sigma (DFSS) holder can be between $55,000 and $122,000.